Looking for something different with beef? 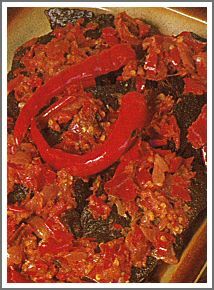 Maybe you could try this Spicy Dried beef slices or Dendeng Balado, one the easiest of Indonesian Recipes. This beef recipe uses a lot of red chilies. It’s very delicious and suitable as a side dish to decorate the yellow rice. See the lovely picture of tumpeng, the colorful and decorated yellow rice. People tend to like this dish. It’s hot but light. If you use this Indonesian recipe as a side dish, you’re will certainly have a successful party at the food area. Skip this part if you use ready to use beef slices. Work the salt and lime juice into the meat and then let it dry in the hot sun until is very dry and resembles beef jerky. Several days of drying may be necessary. Baked the slices in the not too hot oil, you’re just need a few seconds, about 10 seconds to bake it, not too long or you get burned beef slices. Set aside. Heat some vegetable oil in the frying pan, add red chilies, shallots, and tomato. Stir it until fragrant. Add the beef slices and stir fry to coat the slices and distribute the flavor.